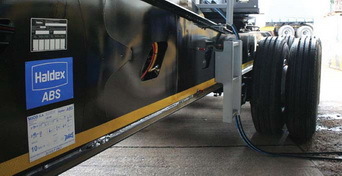 Home FleetWatch 2011 Trailer maintenance a major concern! Internationally recognized brands help ensure trailer profitability. Despite a growing trend among leading operators to manage their fleets according to ‘˜best practice’ principles, recent Brake & Tyre Watch statistics show that truck trailers continue to be under-serviced. Apart from the obvious road safety implications, poorly maintained trailers also pose a serious threat to the sustainability of the fleets they service. FleetWatch asks SAF-Holland SA’s technical manager, Simon Dolphin, for his take on the issue. FleetWatch: What are your impressions of the overall state of trailer maintenance in South Africa? FW: What are the most frequently neglected components/areas of trailer maintenance? SD: In my experience, brakes, boosters, slack adjusters and suspension components are the most poorly-maintained components, followed by the all-important kingpin. The fact that we regularly drive in front of or behind one of these under-serviced trailers or tankers is extremely worrying. You generally find on inspection that brake boosters are disconnected or even removed. I have seen cases where trailers are running without brake shoes or cam shafts or slack adjusters! The scary thing is, operators will continue to load and deliver using these trailers rather than repair them. All trailer running gear should have dealer service support. FW: What are the direct and indirect cost implications of poor trailer maintenance? SD: A poor or absent trailer maintenance programme will always carry negative cost implications. Truck accidents are never cheap and how many operators can afford late or non­delivery due to trailer breakdowns? In these cash-strapped times, the cost of trailer repairs seems to outweigh the risks of trailer failure. Regular maintenance is overlooked because the operator does not carry the necessary trailer parts stock or doesn’t have the necessary cash reserves to sustain the operation legitimately. Truck transport may be cut-throat but it is definitely not an industry where you become rich overnight. FW: Describe a healthy trailer maintenance schedule/programme. SD: A proper trailer maintenance schedule should coincide with the regular inspection and servicing of the truck-tractor. Companies themselves should ensure that they have somebody of competent knowledge and training to do “pre-check inspections”. Drivers should be supplied with “Daily Defect books” and there should be a repair journal kept in the workshop where repairs are signed off. In the UK there is a specific ledger available for this industry which is regulated by the Department of Transport. At any time, the department can request these items for investigation to determine whether or not vehicles are kept and maintained to a high standard of repair. Unfortunately in South Africa, no such practice exists. All too often, a quick cho-cho (bribe) seems to ‘˜fix’ the problem. FW: How can suppliers assist in overcoming the problem? SD: Trailer manufacturers should be more proactive in their after-sales approach and offer comprehensive trailer maintenance services to their customers. Perhaps the truck-tractor suppliers should offer scheduled trailer servicing to coincide with the truck-tractor service schedule. Trailer component suppliers should have strict quality guidelines and also offer solid service support. Trailer buyers must always check the credentials of component manufacturers to ensure product quality. SAF-Holland, for example, only works with recognised, internationally successful suppliers. The best components will be those that are designed to not only improve safety and longevity but also reduce maintenance time and associated costs. By investing the necessary time and money on quality-controlled trailer maintenance procedures, operators can rest assured they’re operating not only cost-efficiently, but reassuringly safe too.